County Intermediate & Novice B success for the BARRS — St. Finbarr's A.C.
Munster AAI Juvenile EA, Novice & U/23 XC Champs 2016, Ballinahina, Co. Cork, Sun 23-Oct-2016, 11.30am. A Very Merry Christmas and a Happy New Year to all! Ballycotton 10 Entries - Don’t get left out in the cold! New lightweight club running jackets now available!
! !Warm weather advisory – Friday training rescheduled!! The Cork City Marathon 2013 – all 26.5 plus miles ? Cork City Marathon 2013: Fees set to rise on April 1st! Holy week weather looks madder than a March hare! St. Finbarr's Cork Half Marathon - Stewards Wanted! Ballycotton 5 Series after 2 races. Paddy Hennessy - Founder Member of St. Finbarr's A.C.
How long is a statue Mile? Cork County Intermediate Cross Country Champions!!!! Claire McCarthy to represent Ireland in European Championships!!!!! Munster Intermediate Cross Country Champions! Novice Mens and Womens County Cross Country Champions!!! Route 2 Crook 5M Road Race, Sun 07-Aug-2011, T.B.A. Austrian Ironman - Our Ironwomen! Races all over the shop! 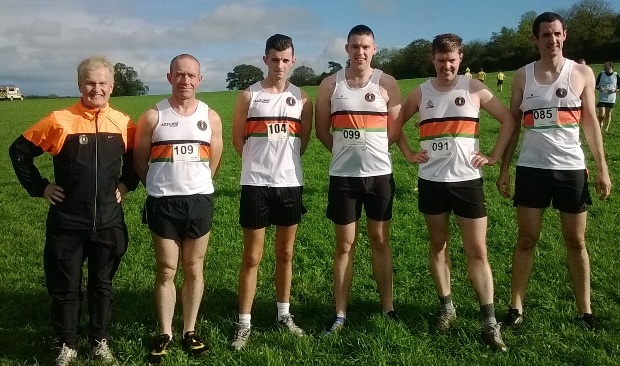 For the third Cross Country outing of 2014, competitors at the Castlelyons venue were blessed with unseasonably mild and sunny weather. By the time the Intermediate Men’s race got underway at 12.30pm, Mr. Blueskies was on show in his Sunday best. Instead of worrying about protection layers, the main concern was how to stay cool for an 8km dash around North Cork’s lush pasturelands. 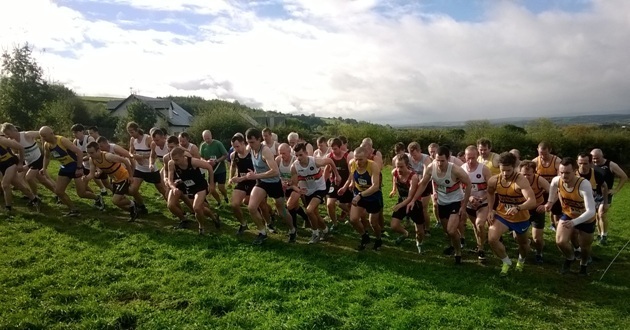 A group of 30 runners competed for the County Intermediate title, which was won in style by Michael Harty of East Cork. The BARRS’ Rory O’Sullivan (4th) kept in touch with the leaders for most of the race until Harty pulled away on the final lap. Michael Houlihan (9th) was second man for BARRS followed by David Butler (14th), John O’Sullivan (18th), Stephen Geoghegan (19th) and Gerry Cronin (22nd). Top ten finishes by O’Sullivan and Houlihan and solid performances from the other four ensured the BARRS edged out Mallow and Grange Fermoy for the Silver. The Sun took a lunch break during the Juvenile races, but was back in action when the Novice B Men’s race was called at 2.30pm. A strong field of 66 runners lined up for the Novice B. 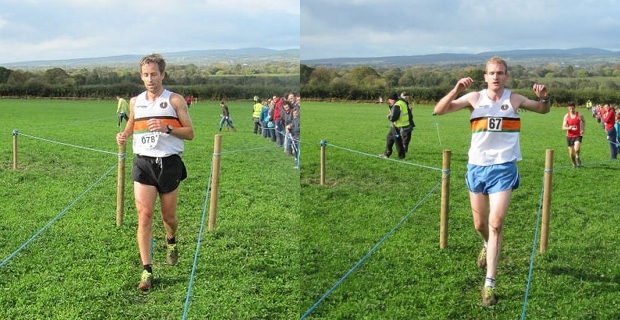 By the time it was over, we’d been witnesses to a seldom observed phenomenon, two BARRS athletes in a dog fight for 1st and 2nd place at a County XC. Ian Dorgan (1st) just managed to outkick Denis O’Driscoll (2nd) meters from the finish line. Strong team performances from David Leonard (22nd), Dave Sheehan (39th) and Eoghan O’Crualaoi (44th) helped the BARRS to edge out Eagle and Leevale to take the Novice B title and the !!GOLD!! medals. Well done to St. Nicholas A.C. and the Cork AAI for a very well organised event. The marquee serving tea, sandwiches and cakes was a great addition and provided welcome shelter from the wind and rain that made a very brief appearance as if to bring the curtain down on the day’s proceedings. The small contingent of BARRS who travelled to North Cork more in hope that expectation had much to savour on the return journey home.